I just stopped in to my local T-Mobile in Chicago, and to my surprise there was no sign of Windows Phone anywhere in the store. When I asked the employee where it was, she mentioned that T-Mobile was really not focused on Windows Phone because there was a "very specific market" for those devices (whatever that meant). I then asked her about the HTC Radar, and she confirmed they were getting it, but didn't have any information to share. It strikes me as surprising and sad to see that Windows Phone has been overlooked in this way. I'd be really interested in hearing from our readers about their experiences. Is this a sign of things to come from T-Mobile? Unfortunately there is this misplaced idea, amongst retailers, that Windows Phone is somehow a business device only. This is legacy from Windows Mobile days. I see it here in NZ stores also. What's the bet that pro Android & apple reps happily perpetuate the misnomer. As all current WP7 users will attest it is in fact a fantastic consumer device. T-Mobile's been missing Win-7 Phones for a while now. I wrote about it back in early September. Very frustrating. Well that's about the dumbest thing I've heard recently. Considering they are the only major (and I use the term loosly) US carrier that doesn't have iPhones, can they really afford to limit their choice to just android? Granted android doesn't sell poorly, though I can't imagine why, Windows Phone is a viable alternative. With Mango it is getting pretty good reviews, and the HD7 is a fine device (yes I have one). You would think T-Mobile would want multiple WP models to make up for not having the iPhone. Unfortunately for WP7, I have the same experience here in Canada. Walk into a carrier store and you'll find maybe one WP7 phone NOT prominently displayed. And the staff are clueless. Ask them about the iPhone or the latest Android and they are all over you. The same is true of the Future Shops/Best Buys/Walmarts/etc. of the world. They are ALL OVER the latest iPhone or Android phone -- happily describing and displaying all the great features and talking about how powerful the processor is, and how it's got the latest O/S, etc. etc. Unfortunately for Microsoft, WP7 has been relegated (by the media and the masses) to a 'special, technical geek' status -- even lower than Windows Mobile. And part of the problem, I believe is we don't see ANY volume of new phones coming out with WP7. Every week, I hear about the latest and greatest Android-based offering, or the 'rumours' of a new iOS release or a new iPhone. 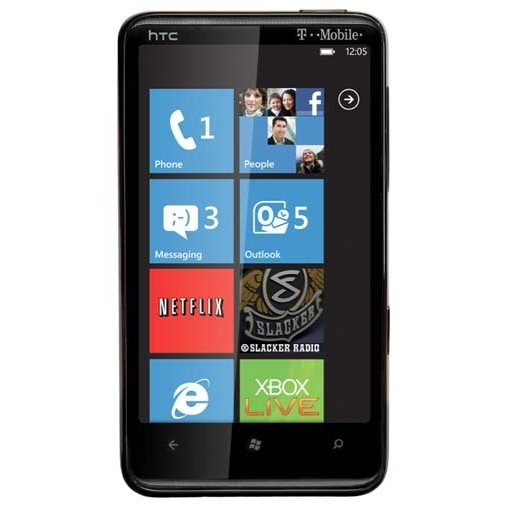 If Microsoft wants to make ANY impact on the phone market with WP7, it's going to have to kick the manufacturers (listening HTC?) into high gear and get some PHONES out there! I really don't get that. WP7 is about as easy to setup and use as any phone out there. Certainly no harder than the iPhone and way easier to do than Android. You can use any of them right out of the box with minimal setup of course, but to get them your way, seems a wash between WP7 and iPhone. Certainly no geek required. Makes your life easier if you are a Live user with WP7, but it makes your life easier if you are an iTunes user/have an Apple acount on the iPhone, and are a Googler (G-mail, etc.) with Android. Wow, really? Wow. People who think like that haven't picked up a MS phone since WM5. I guess I was just surprised because the last few times I'd walked into T-Mobile stores here in Chicago they at least had the HD7, and even some animated advertising (on a giant LCD screen) showing off the phone and operating system. I realize the phone is now almost a year old, so some of this is to be expected, but for there to be zero presence in the store is pretty lame. It seems to me a no-brainer that if T-Mobile wants to compete moving forward without the iPhone they will need a stable of interesting and different mobile phones, and I was hoping that this meant Windows Phone 7. I totally agree -- Android is the ultimate 'geek' phone from what I've seen -- but it's still selling WAY MORE than WP7 and even exceeding iOS in some markets. The problem is the sales force and the lack of product. It's not selling, simple as that. It's not due to lack of a sales force, or some misplaced idea by retailers that these are business phones. It's because it's difficult to gain traction in an overcrowded market (that already has a variety of excellent devices) without offering some innovative and/or standout features. The Metro UI, though very pretty, frankly doesn't offer any significant benefits for most people. And this phone is too heavy. However, I have good news for Microsoft fans: last week I saw a WP7 device in the wild for the first time. And the upcoming N800 has the potential to do well with its clean iPod nano-esque design (though it's not very ergonomic... I sure wouldn't buy it). Personally, I await the Galaxy Nexus.